What is the value of healthy soil? Before a value can be estimated, we need to describe – What is soil health? Soil health is a combination of physical, chemical, and biological properties that impact the function and productivity of the soil with several of these characteristics directly impacting the economics. 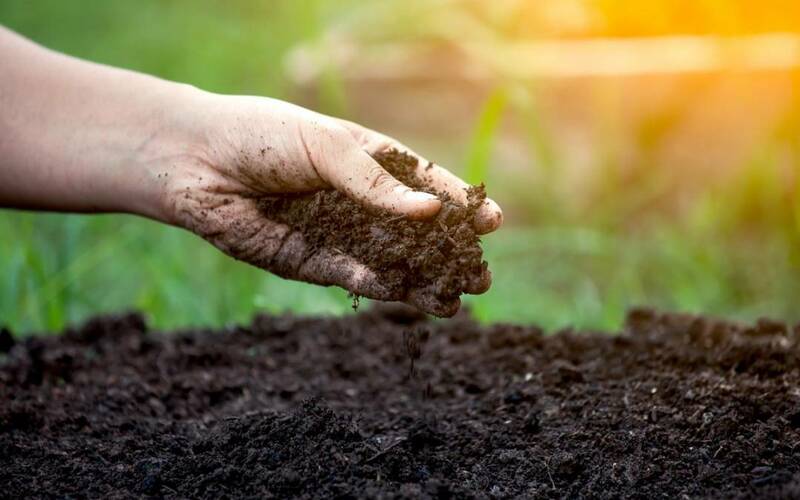 Soil organic matter functions and contributes to several beneficial changes in soil such as water and nutrient holding capacity, water infiltration rates, soil aggregate stability, and to an extent soil structure. Other contributing characteristics that we think we can measure in economic terms could be soil changes such as soil compaction. While it would be difficult to place a value on any one of these properties, it may be possible to provide an example of an estimate of two products of these soil health properties such as: the availability of water and maintenance of nutrients in the soil. Water available for plant growth is the result of two functions, infiltration of precipitation and the ability of the soil to store precipitation; in other words the soil available water holding capacity. In the short-term, water infiltration (water entering the soil) can be effectively influenced by management more than the water holding capacity. By maintaining crop residues on the soil surface, studies indicate that the amount of water entering the soil can be increased up to 2.5 inches per hour. soybeans, and wheat, this could equate up to $7 per acre in additional income depending on the amount of residue maintained. The majority of this benefit is gained by maintaining at least 1,000 pounds of residue on the soil surface at all times. This equates to approximately 30 percent ground cover of corn residue or 40 percent soybeans and wheat residues. 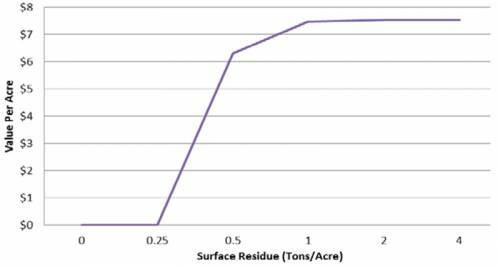 It would appear that maintaining more than 1,000 pounds of crop residue on the soil surface has a minor benefit to crop productivity. However, the long-term impacts may be much more dramatic. One of the most beneficial soil health properties is that of soil organic matter (SOM). A typical acre of soil 6 inches in depth weighs about 1,000 tons. One percent organic matter equates to 10 tons of organic material. for every percent increase in SOM, an additional 16,500 gallons of water is available in the soil. Using the same commodity prices to estimate water infiltration, this would equate to an additional $13 per acre income, per percent increase in organic matter. Soil organic matter may also be a significant source of nutrients. A medium textured soil profile approximately six inches deep will weigh approximately two million pounds. At an average mineralization rate of 1.5 percent, this could account for up to 17 pounds of nitrogen and 1.75 pounds of phosphorus per percent of organic matter. At current prices of commercial fertilizer, this would amount to approximately $11 per percent of organic matter. Using 1 percent SOM as a baseline level, the total long-term value of a 1 percent increase could be estimated at $24 per acre for the nutrient value and available water holding capacity. These estimates are based on central SD with an average of 17 inches of precipitation annually. Actual results will vary based on precipitation amounts and intensity, starting soil health conditions, crop rotation, and tillage methods selected. What is needed to improve soil health and its value? Eliminate tillage – eliminating tillage minimizes the loss of organic matter, reduces the impact of compaction, and protects the soil surface with plant residue. Diversify crop rotation – adding high residue producing crop types provides a variety of unique root structures and types of residue to the soil surface. Nutrient management – The core concepts of nutrient management (the 4 Rs) are applying the right source of plant nutrients at the right rate, at the right time, and in the right place. Managing a component of soil health comes down to the 4Rs of nutrient management, starting with annual soil testing and the other Rs will follow. The soil testing “annual checkup” will lead to maintaining soil fertility for crop production and the long-term development of soil organic matter. Mannering, J.V. and L.D. Meyer, 1963. 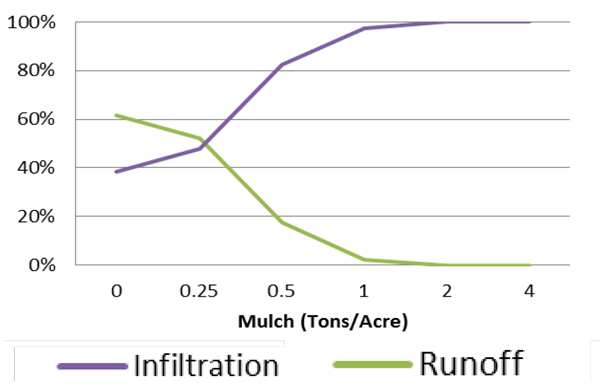 The Effects of Various Rates of Surface Mulch on Infiltration and Erosion. USDA-NRCS. Soil Organic Matter Soil Quality Kit – Guides for Educators. 2019 Menoken Farm | Bismarck, ND | Website Design by Up & Running Design Co.